This guide explains how to register your limited company online using the Company Wizard. For more general information on Limited Companies please refer to our Limited Company FAQ section. The Company Formation Wizard will allow you to register your company quickly and easily using a simple tab based interface. We save all your information as you go along, so if you need to return later that's not a problem. You will only be prompted to pay for the company formation service once you have entered all the required information. Upon submission it will typically take 3-4 working hours before you will be issued your company registration number and a certificate of incorporation. You are then free to trade with your new company. When completing the forms there are a series of red and green indicators below each tab which enable you to see which sections have been successfully completed and validated. Initially these will be red however once you complete each section they will turn green. 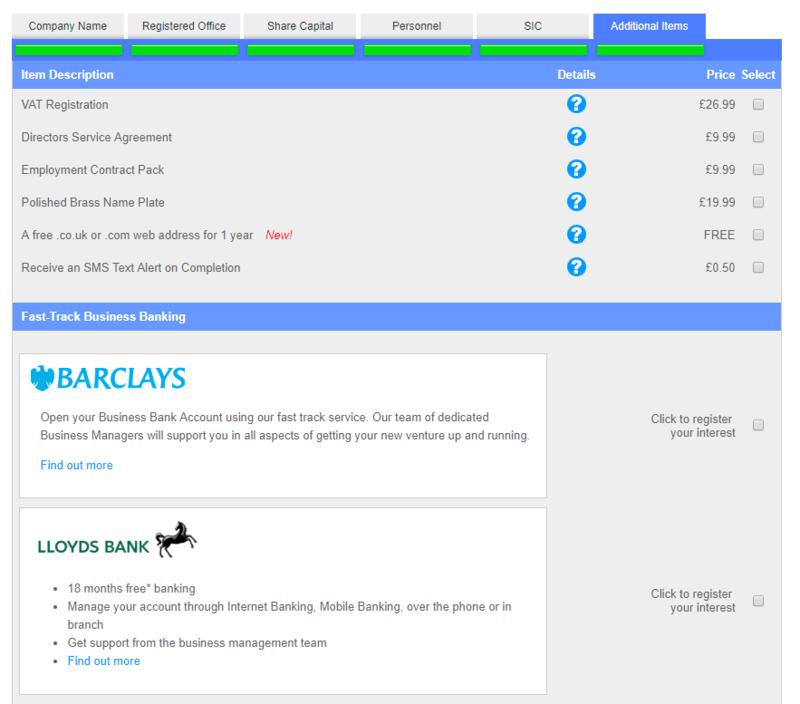 Once all the indicators are green you will then be given the option to submit and pay for your new company. The first step is to register on our Company Formation Wizard by providing some basic contact details and an email address. Once you have registered you will be able to log back on at any time to review or update your incorporation details. When you enter the company name here the system will automatically link in with Companies House to check the name is available. 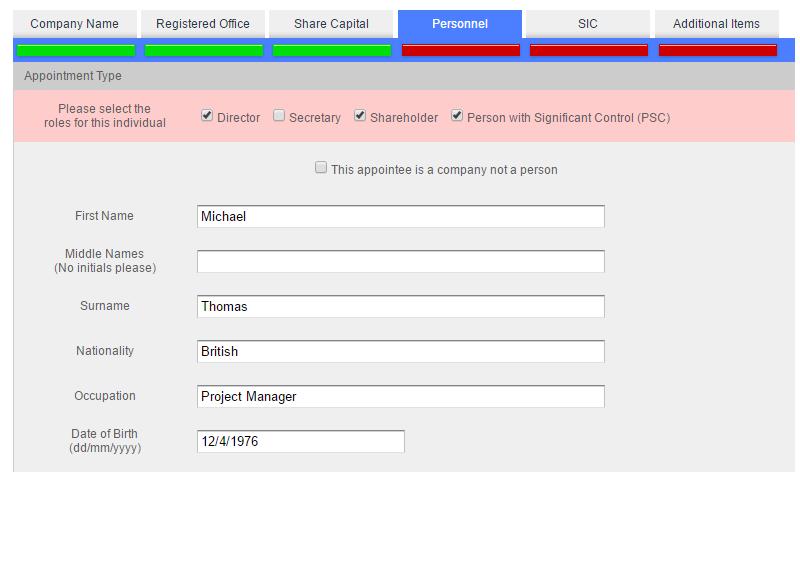 The company name section will appear as valid (Green Indicator) once you have entered a unique name. The name will also be cross checked against the sensitive word database to ensure that if you use a sensitive word such as Group or International you are also able to provide the relevant supporting documentation. Don't worry, we'll help you with that! The Registered Office is the address where Companies House will send any statutory documents or forms. This address must be based in the UK and can be a residential or business address. 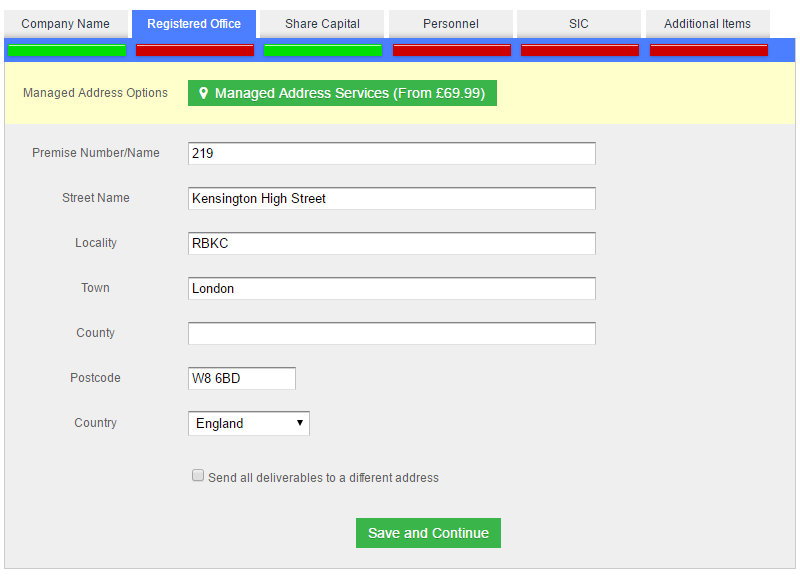 You may wish to consider our London based registered office address service. This will enable you to take advantage of our prime location in Kensington with full mail forwarding facility and virtual control panel. You can also specify where you would like your items to be delivered here. Company ownership is divided up through shares. The statement of capital enables you to declare the value and currency of your shares along with the associated voting and dividend rights. The shareholders collectively own the company in relation to how many shares they have. At this stage we are only concerned with the denomination of the shares. In the personnel section we can allot these shares to the shareholders of the company. The personnel will be any individual or company who will act as either a director, secretary, shareholder or a person with significant control. In the personnel section you simply need to select the type of appointment you'd like to make and then enter the relevant details on the following screen, this would typically include the full name, date of birth, nationality and address. For shareholders you'd also need to enter the number of shares issued. From June 30th 2016 all new company incorporations must include the details of all individuals who will exercise Significant Control in your new business. You can find out more about People with Significant Control (PSCs) here. From June 30th all newly incorporated companies must supply at least one classification code for their new business, these are referred to as Standard Industrial Classification (SIC) Codes. These codes loosely define what sort of business activities the company will engage in. We've made this process very simply so you can easily search by keyword and enter your relevant classification. Before you place your order you may like to review our related products and services. Many of the prices have been reduced from their normal retail price. You can easily add or remove items here and the price will adjust accordingly. Once you have completed payment, your application will be marked as paid and will be reviewed and processed by an administrator. The documents are then formatted and sent electronically to Companies House, your application will then be assessed by Companies House and subject to acceptance we will receive a digital certificate of incorporation for your company (usually within 3-4 working hours). Once we have confirmation from Companies House we will advise you accordingly and prepare your documents to be posted out first class. If for any reason the application fails we can resubmit as many times as required without further charge.